A hilarious spoof annual honouring England's favourite son, Sir Gareth of Southgate. 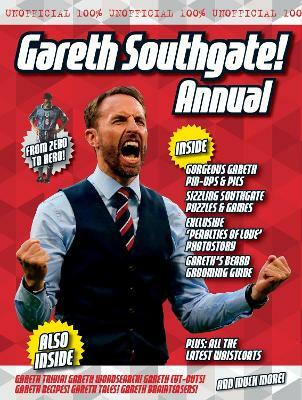 The Unofficial Gareth Southgate Annual is officially the only 100% Unofficial annual to feature the man who as a player famously missed a penalty and clutched defeat from the jaws of victory, only to turn that 22 years of hurt into a series of nail-biting wins at Russia 2018. Though he didn't succeed in steering the exciting new England team to a glorious final, this year's man of the moment is Gareth Southgate. This book is for anyone who remembers Euro '96 as the golden age and is now dusting off their cynicism reliving their youth, as well as a whole new generation of untarnished England fans. It's for all lovers of the beautiful game as well as lovers of a well-turned-out waistcoat. Fun games and activities include: - Dress-up Gareth football hairdo doll - Gareth's 'A-Maze-Balls' Amazing Football Maze - 'What Would Gareth Do?' problem page - 'Gareth and the Amazing Technicolour Waistcoat' story - Gareth's 'World of Cups' World Cup Game Plus masks, quizzes, games, brainteasers and a whole lot of football-related fun.